Buying good wooden flooring is a more complicated process than you may think. The best engineered wood flooring fits together snugly, without producing any waste. This is something that you won’t find with carpet, or other flooring options. So where do you find the best engineered wood flooring? 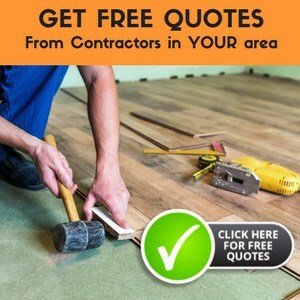 Many people choose to buy their flooring online, but this doesn’t give them the opportunity to see the flooring in person before they invest their money. This review article can help you. Let’s take a look at three of the best engineered wood flooring options that you can find online. Remember to check out our selection of the best wood flooring of the year! 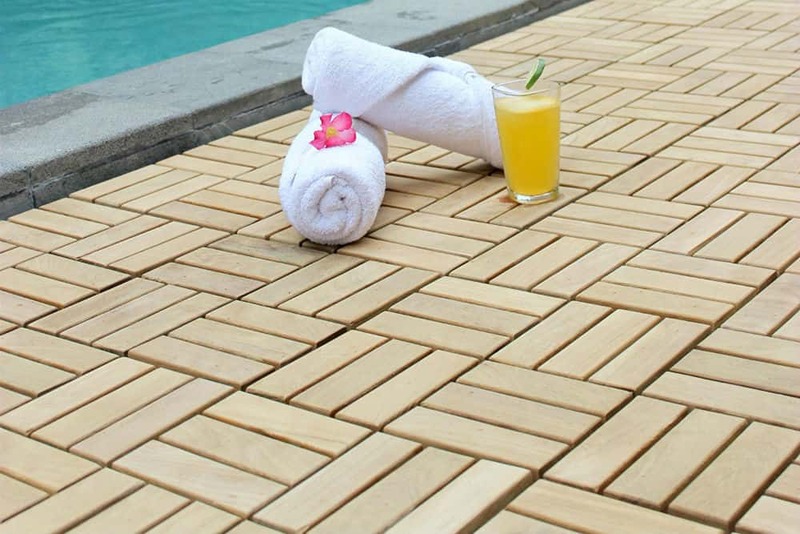 This attractive teak flooring comes in a choice of two, eight, and 10-piece packages, with the latter containing enough tiles to cover a space of 10 square feet. The panels themselves have a square shape, which makes them easy to slot together, while also allowing you to account for awkwardly shaped floors. This means you won’t have to deal with chopping up a bunch of elongated planks to get them to fit on your floor. Each tile has an interlocking pattern on its outer edges that allows you to snap the tiles together directly. They also fit together snugly, so you won’t have to worry about bringing any glue or other adhesive into play. It really is as simple as popping the panels together and shifting them into place. Furthermore, you can use the tiles both indoors and out. Imagine building a nice outdoor terrace, where you can enjoy quiet evenings in the garden. The BARE-WF2009 allows you to do that, and much more. You won’t even need any tools, thanks to the interlocking panels. This also means that you won’t have to spend even more money on professional installers. Armstrong’s panels look more like what you may expect from wooden flooring. They’re long and rectangular, which gives you that nice, clean finish that you’re looking for from the best engineered wood flooring. Better yet, each package comes with a mix of sizes. Ranging from 9 inches to 48 inches, these panels offer the flexibility you need to create great looking wooden floors. You’ll receive enough panels to cover 30 square feet of floor, which you’ll notice is three times as much as the Bare Décor packages cover. These panels are also a great choice for the traditionalist, as they look more like what you’d expect wooden flooring to look like than Bare Décor’s offering. The attractive canyon oak coloring ensures this wooden flooring looks great, no matter where you install it. Furthermore, you have a choice of stapling, gluing, or allowing the panels to slot together and float. This means that you shouldn't run into no problems with installation, though Armstrong does provide a professional installation service as well. With over a century of experience in the flooring industry, Bruce has established itself as a manufacturer of some of the best engineered wood flooring around. The E3512 Turlington range is of an extremely high quality, which means that its reputation is safe and sound. You’ll receive enough panels to cover 28 square feet of floor space when you order this wooden flooring. While that’s slightly less than Armstrong’s offering, it’s almost triple what you receive from Bare Décor. However, Bruce recommends that you only use this flooring for residential spaces, which suggests that it may not be able to withstand the wear and tear that comes with a commercial application. Available in 3 and 5-inch varieties, these wood flooring panels offer a choice of four colors. From Smoky Topaz to Molasses, you should find a color that suits your needs. The flooring also looks the part once it’s installed, though be aware that you will need to use an adhesive to ensure it stays in position. Instead of coming in rolls, the best engineered wood flooring comes in panels, which you can slot together as needed. Furthermore, you must understand that all woods are different. You’ll need to check that you like the aesthetic quality of the wood’s grain, in addition to checking the wood’s finish. Cheaper products tend to have poor finishes, whereas the best engineered wood flooring will last for many years, no matter how many people walk across it. Each of these products represents some of the best engineered wood flooring that money can buy. But which one is right for you? In the end, it comes down to what you’re looking for. Both the Bruce and Armstrong panels are ideal for residential use, and they’ll look great in the bedroom or in your sitting room. However, Bare Décor’s panels may be the best engineered wood flooring available. They’re certainly the most versatile, as you can use them both indoors and out. Furthermore, they require no tools for installation, and the panels are small enough to make installation simple in even the most awkwardly shaped rooms. The only downside is that a package of Bare Décor’s panels covers far less floor space than the Bruce and Armstrong options, despite sharing a similar price tag.